Protect your association against potential payment disputes by adding signatures to credit card receipts. No matter how transactions are run, you can easily collect a member’s signature to verify payment. Add an extra layer of protection against claims of fraud or payment disputes. Ensure you and your members understand and agree on all payments. Capture signatures in person on a touchscreen device or online with a mouse. Adding a signature can help you prove transaction approval and protect your association in the unlikely event of a chargeback or payment dispute. You can also store signatures electronically to confirm payment authorization for future transactions. Add a signature to receipts to confirm payments—even when bills are paid online. Request signatures via email or let members sign with a mobile device touchscreen or a mouse. 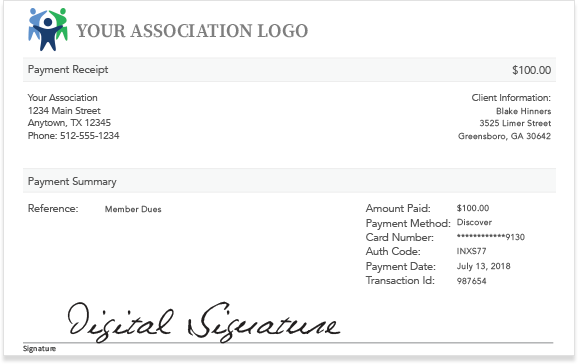 Signatures are securely stored so you can always prove a payment was confirmed by your members. Conveniently manage receipt settings in your AffiniPay account. Collect signatures in advance with a credit card authorization form. Get one signature for every transaction run within an agreed upon time frame to authorize Scheduled Payments. From multiple easy ways to get paid, to reporting and reconciliation features, and top notch data security—we've got you covered.